Something for bedtime: I almost always pick up a new pair of jammies for Jacob's basket. With summer quickly approaching I love to stock up on the shorties PJs from gap, old navy, carter's and gymboree. Something for mealtime: A friend introduced me to these Dinner Winner Plates. You fill each section with some food and then hide a small prize or treat at the end. Your child eats their way through the board (like a game) in order to get their treat at the end. Genius! Something practical: We've been trying for quite some time to teach/train Jacob to sleep in just a little bit later. We're not asking for a whole lot - we just want him to get up no earlier than 7 am. I've heard amazing things about the OK to Wake Clock, and we're excited to try it out. If there's one thing Jacob definitely understands, it's "green means go." Something to read: Are all toddlers book lovers? Or just mine? We picked up "Oh my Oh my Oh Dinosaurs" for him as well as "Pete the Cat: Old MacDonald had a Farm." Something for the pool: Jake is doing AH-MAZING at swim class now that he's moved up to the big boy class with coach and no more mommy and daddy. We've noticed that swimming down to the bottom of the pool to retrieve dive sticks and rings is one of his favorite parts of the class.I picked up these Jolly Jellyfish Sinkers, which I know he'll love using in our pool. Something for the beach: Besides chasing the waves, Jacob's favorite thing to do at the beach is have an adult build him a sand castle, and then stomp it to smithereens. With this brick and trowel set we'll be able to build even more elaborate castles for him to destroy. We also have the Seaside Baking Set, which is our favorite beach set, as well as the Clicker Crab pail and shovel. The entire Melissa and Doug beach line is durable and adorable. Something to eat: Besides his Easter eggs, which we'll fill with fruit snacks, puffs, goldfish, and other small treats, I picked up these Lindt mini frogs. Jacob loves anything chocolate and I know he'll get a kick out of the fact that they're frogs! Every Easter basket needs something sweet, even if your kiddo will have plenty of help eating it! Something to watch: We have been waiting for forever (feels like it at least) for SING! to come out on video! It was the first movie little man saw in the theater and he LOVED it. We'll be watching this on repeat for months to come, which I am totally ok with. I can only take so much Polar Express which we have been watching on repeat since DECEMBER. 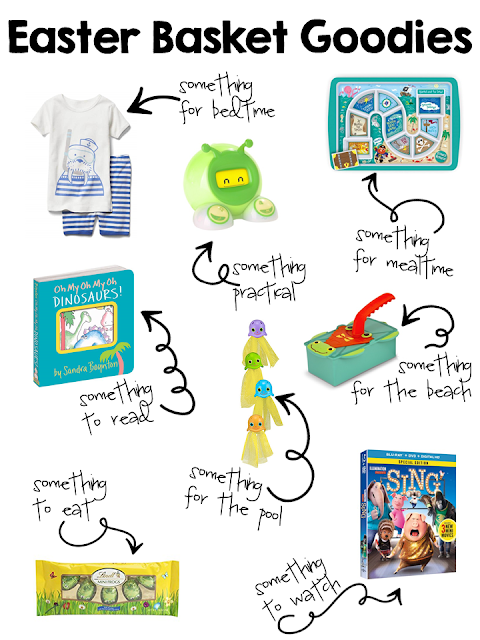 Hope this round up gives you a few ideas and that you have fun putting together baskets for your little ones! Happy spring friends, XO.